It turns out that we had the dates wrong for the Rugby game and it's actually only next Saturday, which was a little bit of a downer at first, but actually turned out to be a blessing in disguise since I was so busy getting ready for Valentines Day yesterday and trying to get as much class work done as possible. Today, however, is the U2 Concert and I cannot wait until this evening! I will be sure and take lots of pics and let you know how it goes. We had a little hic-up this morning regarding parking because it is all sold out (as impossible as this may seem - you have to buy a parking ticket in advance), all the park-in-rides were also sold out and so the only option left was to buy train tickets which depart out of the city centre. I had a minor break down at the ticket place because I don't want to be driving around the city centre at night (not a good idea), but the woman assured me that many concert go-ers had bought tickets and that it would be a fun "adventure." We will see how it goes... this probably sounds really weird to anyone who hasn't travelled around SA yet, but trains are a no-go here... they are a cheap means of public transport and a lot of petty and not-so-petty theft/assualts occur on trains, so if you are ever here, don't take them. But, this may be a good opportunity for me to ride on a train, since it is probably the only time I will be willing to in the near future and because it will probably be packed with other U2 concert-goers. I will also be sure to take pictures and post about my train "adventure" too haha. 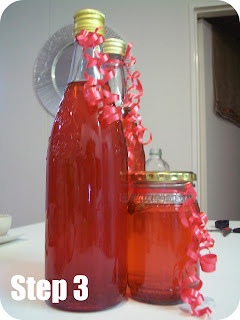 Anyways, the main reason I am posting now it because I wanted to share a very unique Valentine Recipe with you, which I tested yesterday and which came out wonderfully. I know it is a little last minute, but you still have time to run to the store this morning and grab the ingredients... and believe me, it will be worth it! It will also make for a great gift or treat for yourself for any occasion throughout the year, so even if you don't have time to make it for V-day, keep it in mind for the future! This is a unique recipe I found in a South African cooking magazine. The syrup is sooo delish and I have never tasted anything like it. It is relatively easy to make and can be made into an adorable present by just pouring the final product into an empty glass bottle. It's ideal for ice cream, gelatto, cocktails and (I haven't tried this yet), but I think it could also be nice drizzled over steak. Step 2: Simmer on a medium to high heat for 15 to 20 minutes until it reaches a sticky, but runny consistency. Place the hot pot immediately into a sink of ice cold water to cool. Strain into a clean steralised bowl. Step 3: Pour final product into a clean, steralised bottle using a funnel. And voila... there you have the final product! I wanted to also attach a little v-day card with the recipe written on it, but am conveniently out of color ink at the moment. Happy Sunday Everyone and Enjoy Valentine's Day Tomorrow! i'm just wondering, after u strained the strawberry, what did u do to it? did u throw it away or eat it? I just threw them away :/ ... they get pretty soggy from the whole boiling process. 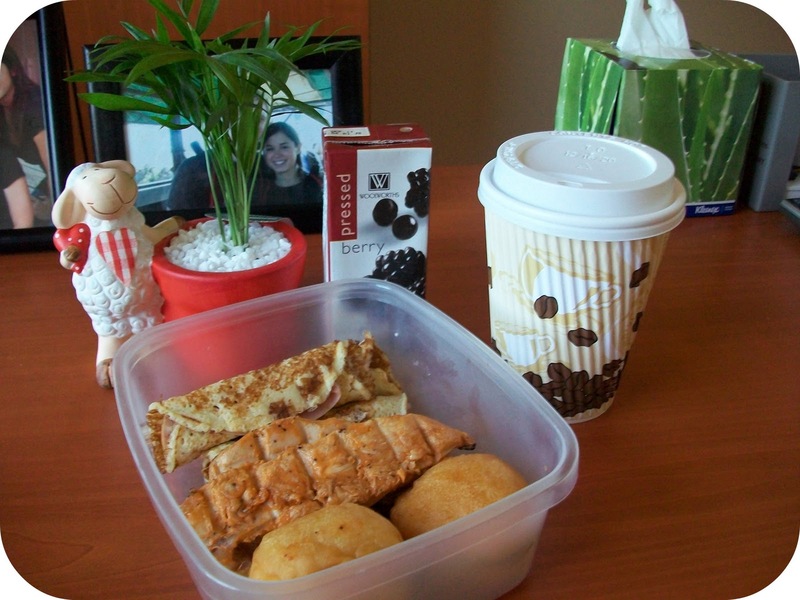 That was so sweet of him to bring you coffee and a cupcake. Love it! And that recipe looks really good...I'll definitely have to try it someday soon. 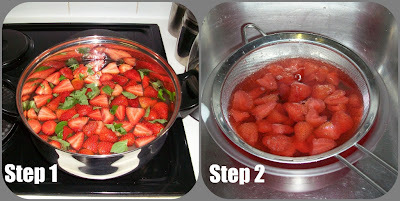 I will definitely have to try this recipe...I love basil and my husband loves strawberry, so this would be a win-win! Your syrup some interesting. I've noticed a lot of the fancy restaurants have been doing similar combos. I'm not sure if I am bold enough to make this at home! Thanks for the recipe. Sounds delicious and looks gorgeous!